PRODUCT DESCRIPTION: 32 oz. ready-to-use spray. Kills June Bugs, Billbugs, Masked & European Chafers, Japanese Beetle & Oriental Beetle, Sod Webworms and Cinch Bugs. Lasts up to 7 days. OMRI Listed® and compliant for use in organic gardening. WHERE TO USE IT: For use on trees and shrubs on home landscapes to control the immature larval stages of the following insect pests: leafminers, leaf hoppers, gypsy moths, weevils, psylids, webworms, hornworms, spruce bud worms, pine sawflies, elm leaf beetle and grasshoppers. Use Directions: The 32 oz hose-end applicator for trees and shrubs will treat up to 10 ten foot trees. Repeat application 2 to 3 times at an interval of 7-10 days. Apply to leaf surfaces to run-off. Be sure to coat underside of leaves as this is where many insects hide. Avoid excessive application. Mole crickets, white grubs, sod webworms, fall armyworms, chinch bugs, hyperodes weevil, and billbugs. Use Directions: The 32 oz hose-end applicator for lawns will treat approximately 2000 – 4000 square feet. 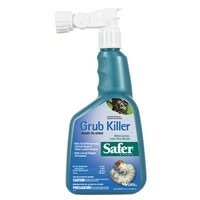 Apply Grub Killer 2-3 times on a 7-10 day interval to insure effective control of surface and sub-surface feeding pests.